What an easy quick card this was to make. I only used dies and some self adhesive ribbon tape. I started out by cutting the Merry Christmas out of white card stock , then I cut the cardinal and bells out of red cardstock. I shorten the bells and ran them through my brick embossing folder to give them texture and them I used my embossing tool to flatten it a bit and give the bells some shape. When I glued both the bells and the cardinal down, I didn't put glue everywhere, so this left some of the cardinal, leaves and bells sticking out away from the card. I think it gives it much more interest. Joan from Colorado good called me to tell me about this cardinal die, saying it was beautiful She is so right, don't you think??? I don't carry the Cottage Cutz dies in stock because of room in my shop, but I can get any of them for you. Very nice, clean and simple. I think that is so pretty. 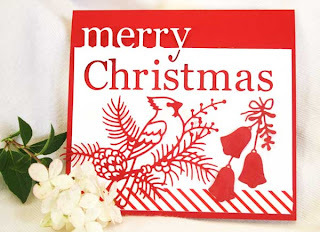 You could make quite a few Christmas cards very easily, and they look impressive! WOW this is FABULOUS! 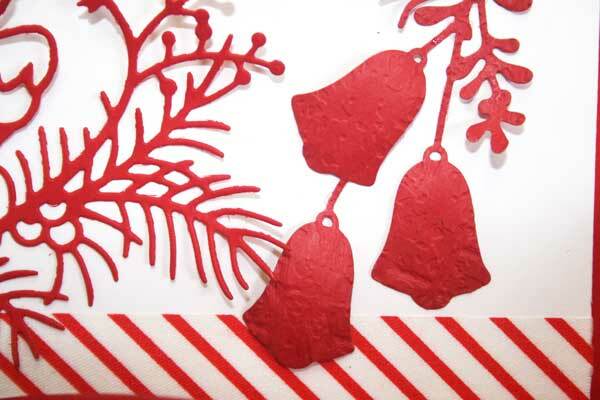 LOVE the red & white ... and, the elements you put together are PERFECT! Thanks for wonderful inspiration! Very beautiful Christmas card. I especially love the Cardinal bird and how it stands out with the red. Cardinal bird has a very special meaning deep meaning for me and I have the Cardinals decorations on my Christmas tree every year.